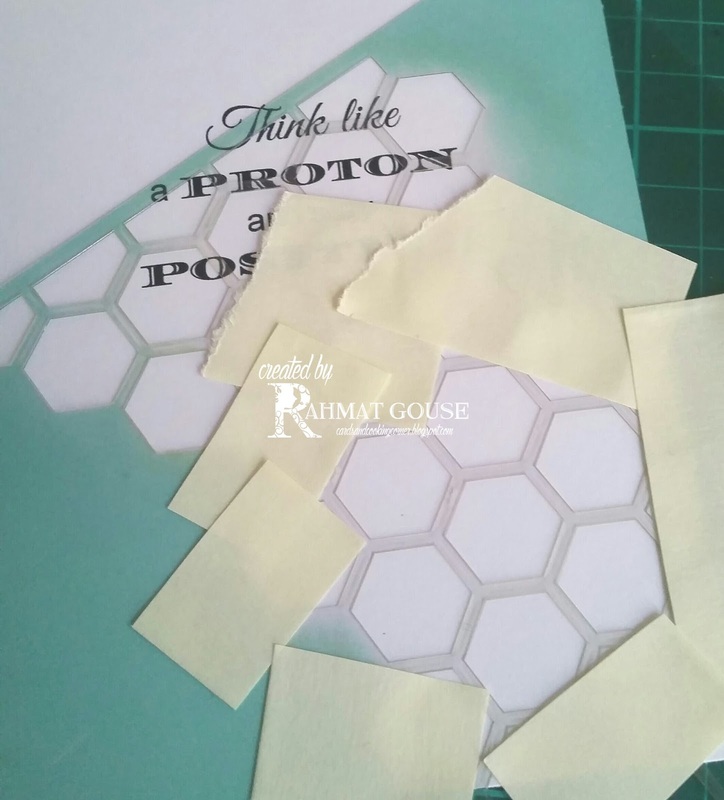 Cards and Cooking Corner: Stenciled Proton! Happy Sunday to all, I am up with a simple stenciled card. i had this quote which I wanted to use for a long time, but was waiting for the right challenge to make. Luckily I was able to sit and craft, so I made a few cards, will post as and when depending on how much screen time I can handle ;) I am a whole better now, but taking time to get back to blogging in full swing. For this card, the sentiment is computer generated, I played around the fonts and spacing, once I was happy I printed it off. 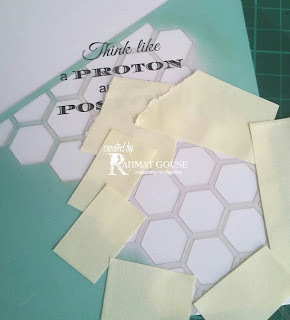 I used Heidi Swapp's honeycomb stencil, and sponged a clustered hexagon, similar to the bondings in organic chemistry, for those who don't know - Chemistry is my favorite subject, specially organic chemistry. I used a pale green pigment for the sponging, masked around so that I don't get around. masked and ready to be inked. 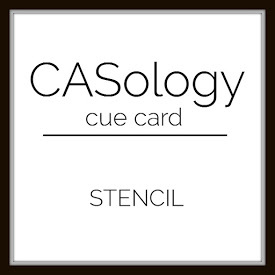 A simple stenciled card here. joining in with anything goes. It is a unisex card, so I am hoping it will qualify here with the masculine theme. Only 5 challenges linked total. I am hoping that my protons card is a right fit here, as there is lot of pops and bangs during a chemical reaction ;) . Very clever take on the challenge. I'll keep the chemistry aside for now - but I love the card - that sentiment is witty and just perfect! Way to go Rahmat! Wow this is a bit technical for me Rahmat... not being scientifically minded, but I can recognise a fab card! LOVE IT! O-chem was not my favorite... I mostly remember during the lecture period watching a girl who sat in the front row sink lower and lower in her seat as the topic became trickier! Again, I love your card! Rahmat, this is brilliant! 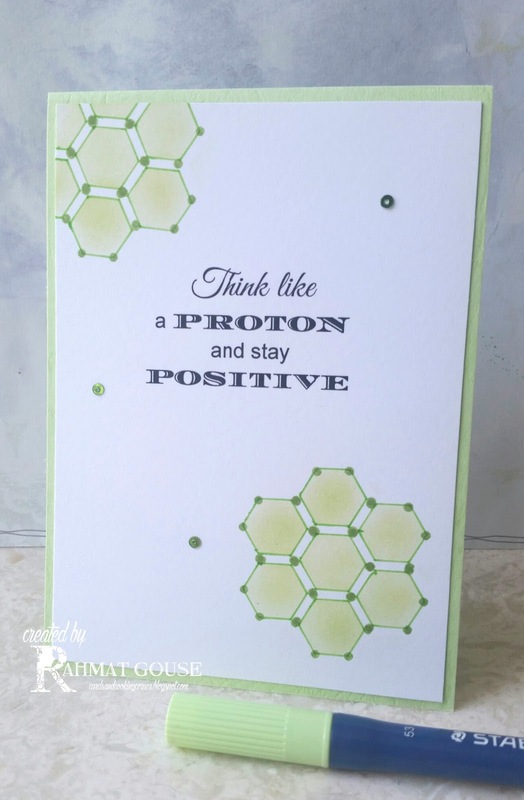 The sentiment is great, and I love how you designed your stencil to resemble chemical bonds! Clever and fun! Thanks for playing along at CASology this week! Ha ha! Rahman, you always have the best sentiments! Love your super clever card! Thanks for playing along with CASology this week! tee hee hee! And oh-so-clever! What a brilliant sentiment Rahmat - and a super card! 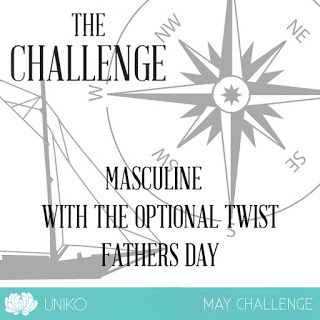 A very clever take on the challenge and a fab card! Brilliant! I loved chemistry too and there were always pops and bangs in the lab. Your card is fantastic and I especially love the sentiment. This is brilliant, Rahmat! Love the science theme and that clever sentiment :) Great to see you at Less is More and at Uniko too. That's a cool idea! Very clever! Very cool and fab card. Thanks for sharing at STAMPlorations.